Drawer (Top Center) - Depth: 16.063"
Clearance Between Shelves, Highest to Lowest Shelf: 13.5"
Drawer (Top Center) - Width: 15.25"
Drawer (Top Center) - Height: 3.5"
Keep your bedside tidy with this solid oak table with drawer. The interior power strip and wire management slot allow you to keep electronics and chargers neatly organized (and unsightly cords hidden), and the dust divider on the drawer prevents overflowing objects from falling below. Soft self-closing guides mean that the drawer will close softly and quietly. Dimensions: W22" D18" H28"
Our Bench*Made Oak collection offers purely American, heirloom-quality furniture. Bench made refers to furniture built with a high level of attention and detail, with each piece individually created from a craftsman?s bench. It?s a standard of quality that we uphold for our Bench*Made Oak collection. We harvest oak from Appalachian region in the eastern United States, careful to select pieces with high degrees of natural characteristics and beauty. 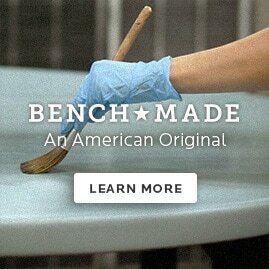 Our artisans then use those quality pieces of oak to create each piece?made to order?in Bassett, Virginia. Whether you need a coffee table, dining chair, panel bed, or more, our collection offers quality oak furniture that you?ll enjoy for years to come. Toffee Oak TOFFEE Alpine Oak ALPINE Flagstone Oak FLAGSTONE Flannel Oak FLANNEL Nubuck Oak NUBUCK Penny Oak PENOAK Peppercorn Oak PEPPERCORN Smoke Grey Oak SMOKEGREY No options match your selection.